Now when your baby is on the movement mat offer rubber or wooden balls, which roll faster than cloth balls as do trucks and vehicles with wheels. 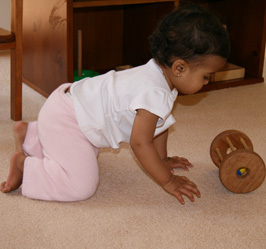 Place the objects just out of his reach so he is encouraged to push himself forward in an action that leads to crawling. Encourage him to reach for the toys by himself. Don't be tempted to stop him making an effort by putting them into his hands. Making the effort will help him to learn to crawl.